Sample letter to give notice to landlord/ homeowner/ malik makkan, police station, court or dealer, lawyer for leaving the house as per requirements. Application letter of 30 days notice to my landlord. I am writing this letter to inform you that I am transferred from Edinburg to Malinda Valley. I am to report there on 1st of the next month. According to our agreement, I had to give a prior notice of 30 days before leaving the house. So this is my formal notice. I also want to request you that my advance money is returned to me on the above date because it will be very difficult for me to collect that afterwards. I hope that you will accept my notice and will give my advance money back on time as per contract. The reason of my writing to you is that due to my transfer in another city I will have to leave your house. I am leaving your house in somewhat urgency because I have to take the charge of my post in the other city. I am thankful to you for providing me your house on affordable rent and I had a great a great time here. With all respect I would like to bring it to your knowledge that I have found a house for me and my family. As I told you that they are moving to Miami from Pakistan, your apartment is very good but it’s not possible for me to accommodate a family of 5 members in this apartment, I have got a new house on rent in the same area near your house. I would highly appreciate if you clear my all bills and rent. And hand over me my deposit as I have to give it to my new land lord. I shall be really thankful to you. Sample application for school leaving certificate (SLC) for your son, daughter or nephew due to house shifting, family shifting or job transfer of father and mother. You will also learn how to write a letter about school leaving certificate(SLC) yourself. With all due respect I beg to say that my father has got promotion and now he is moving to US and we are also going with him. I would like to inform you that I have to leave the school as I will be shifting there and will continue my studies there. I request you to give me a leaving certificate so I can continue my admission process there. I shall be really thankful to you. Sir, I am John Locke and I have been studying at your school for the last 3 years. I have been very good at studies as well as academics since I came here. This school has polished my skills and made me a better student than I ever was and for that I am truly grateful. As my father is in the US Army so he recently got posted to California and because of that I have to move as well. I shall move in a fortnight so kindly grant me a school leaving certificate. I will remember this school in good words as it is nothing compared what this school has given me. I shall be very thankful to you. My son Shoukat Shaheen is student of class 6 in your school. My husband who is working as a SDO in Wapda has been transferred to Multan. Therefore my son cannot continue to study in your school. I request you however please grant him school leaving certificate at the earliest possible time for his admission in new school. I shall be grateful to you. His roll number is: 13 and his class section is PAK. With due respect, it is stated that I have successfully completed my matriculation with 987/1050 marks from our prestigious institute in April 2018 under Federal Board of Intermediate and Secondary Education, Islamabad. My roll number is 116732 and I have no pending dues and therefore request you to kindly issue me the school leaving certificate so that I can apply at other colleges for higher education. Also kindly refund me the security fees. This letter is to request a student transfer letter. As I was the first resident of west wood but due to some reasons we have changed our residence and moved in the bank square society. Due to the large distance to the school I am unable to continue my study in your school. I am seeking an admission in a new school located in my area. It would be helpful if I get a student transfer letter. Sir, I am Harrison Craig and I am a student of 8th grade. With due respect, I have to inform you that my father has been posted to Florida due to his work. He has to report there in the first week of January. Therefore, I have to shift there as well. Kindly issue my school leaving certificate along with teachers’ remarks so that I can submit the documents at a new school as soon as possible. Thank you for your cooperation. I would like to draw your attention that my father is transferring to other state of USA, due to which my mother and I are going along with my father. Kindly grant me school leaving certificate so that I can take admission in next school there. With huge respect, I want to say that I have been studying at your school since my childhood. I remained topper of my class for three years during this period. I also led the school cricket team and won a cup in inter schools tournament. But, now I cannot continue my education from your school because my father is an officer in Pak Army and now he has been transferred to Rawalpindi. I have to go with my family. That’s why I request to you that grant me school leaving certificate so that, I can take admission to another school in Rawalpindi. I also request to you that kindly grant me a character certificate, mentioning all the specifications about my behavior and achievements during my stay at school. 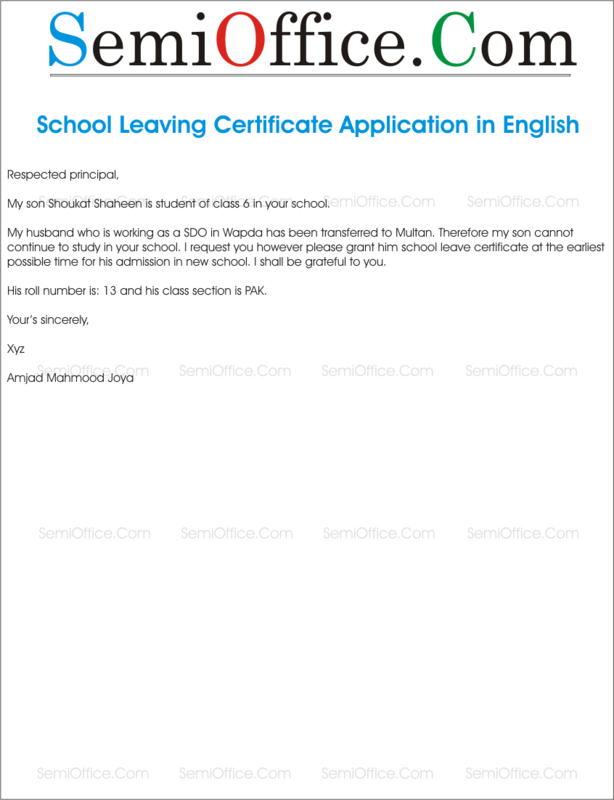 Application for school transfer certificate. Sample application letter to request your school leaving certificate from your school principal, headmaster or where you are studying.